a 2 for 1 Deal - See ad page 76.
a 50% off Deal – See ad page 72.
a Special Discounted Rate – See ad page 103.
a 2 for 1 Deal – See ad page 23. 780-942-3993 See inside back cover. TWO HILLS LIONS GOLF CLUB 780-657-3451. WHITETAIL CROSSING Mundare. 780-764-3999 www.whitetailcrossing.ca See ad page 72. COAL CREEK GOLF RESORT 780-663-2473 Ryley. www.coalcreek.ca See ad page 103. EDGERTON GOLF COURSE 780-755-2462. See ad page 113. WAINWRIGHT RIVERDALE MINI PARK 780-842-2996 See ad page 109. MYRNAM/DERWENT GOLF CLUB 780-366-2190 See ad page 76.
www.twohillsgolf.com See ad page 75. 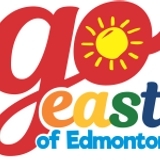 Go East of Edmonton and you will find some of the most unique golf courses in all of Alberta. For example, try to land your ball on the island green at Daysland, and seeing is believing the beautiful black sand traps at Coal Creek Golf Resort. 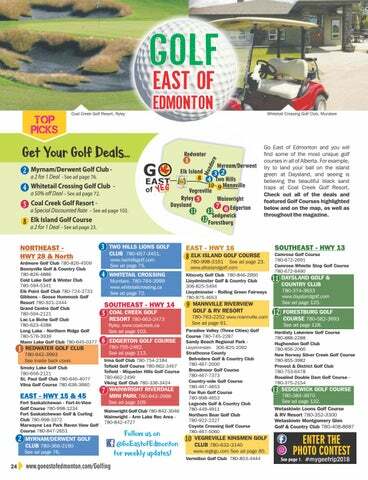 Check out all of the deals and featured Golf Courses highlighted below and on the map, as well as throughout the magazine. MANNVILLE RIVERVIEW GOLF & RV RESORT 780-763-2252 www.mannville.com See ad page 91. DAYSLAND GOLF & COUNTRY CLUB 780-374-3633 www.dayslandgolf.com See ad page 125. FORESTBURG GOLF COURSE 780-582-3693 See ad page 128. ENTER THE PHOTO CONTEST See page 1.